Product prices and availability are accurate as of 2019-03-20 22:55:35 UTC and are subject to change. Any price and availability information displayed on http://www.amazon.com/ at the time of purchase will apply to the purchase of this product. 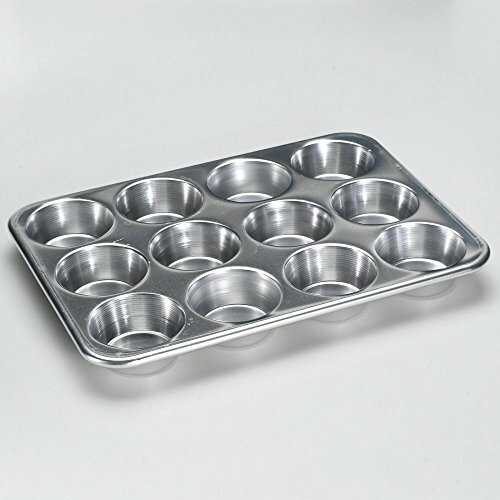 Make smiles by the dozen with this Nordic Ware 12-Cup Standard Muffin Pan. This high-quality, heavy-duty aluminum pan heats quickly and evenly, and includes Nordic Ware's non-stick surface so muffins pop right out. Creased ridge provides extra strength and no-slip handling. Make a batch and watch how fast you can make 12 friends. About Nordic Ware. Founded in 1946, Nordic Ware is a family-owned, American manufacturer of kitchenware products. From its home office in Minneapolis, Minn., Nordic Ware markets an extensive line of quality cookware, bakeware, microwave, and barbecue products. An innovative manufacturer and marketer, Nordic Ware is best known for its Bundt Pan. Today, there are nearly 60 million Bundt pans in kitchens across America. The Nordic Ware name is associated with the quality, dependability, and value recognized by millions of homemakers. The company's extensive finishing technology and history of quality, innovation, and consistency in this highly technical and specialized area makes it a true leader in the industrial coatings industry. Since founding Nordic Ware in 1946, the company has prided itself on providing long-lasting quality products that will be handed down through generations. Its business is firmly rooted in the trust, dedication, and talent of its employees, a commitment to using quality materials and construction, a desire to provide excellence in service to customers, and never-ending research of consumer needs. Heavy duty aluminum cleans easily. Makes 12 perfect muffins. 12-cup capacity. Non-stick surface. Dimensions: 13L x 9.65W x 1.25D inches.